The gunsmiths Horace Smith and Daniel Wesson produced a series of revolvers during the second-half of the 19th century. Along with the Colt and Remington it was one of the most popular revolvers used during this period. Smith & Weston produced its first revolver in 1857. During the American Civil War Smith & Weston's six-shot revolver was were purchased by both sides. In 1870 Major George W. Schofield adapted the American Model. This became known as the Schofield-Smith & Weston. 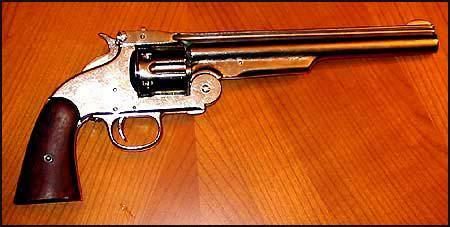 Over the next few years the United States army purchased 8,285 of these revolvers. Wells Fargo also bought them for their guards. Jessie James used a Smith & Weston. Robert Ford also had one and used it to kill Jessie James.